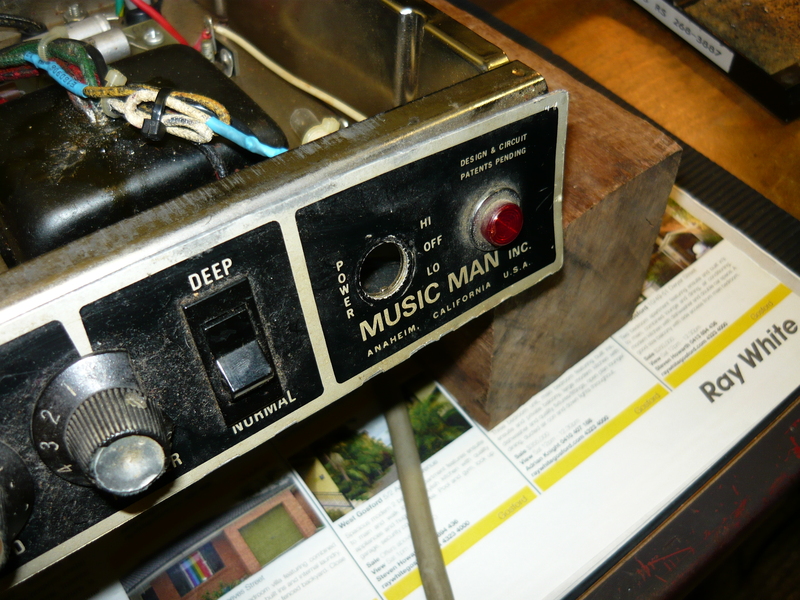 This week’s blog examines a major repair completed this week to a MusicMan 130W 2×12 combo, purchased brand new from Harry Landis Music in Sydney (Australia), and still owned by this customer. These 1970’s manufactured MusicMan amps were among the best of the American amps of that time, and were certainly built to last the distance. They were built to a very high standard by people who knew what they were doing. 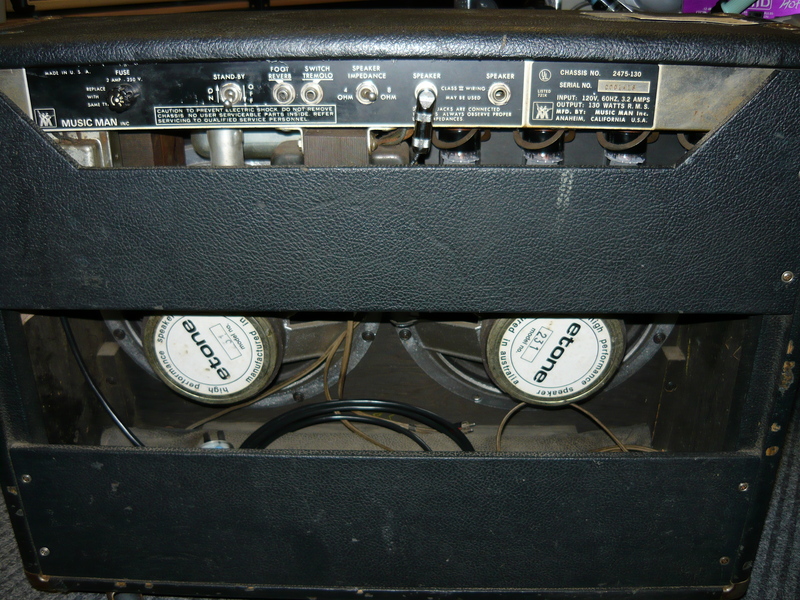 Probably the most popular and most collectable model was the 65W 2×10 combo. 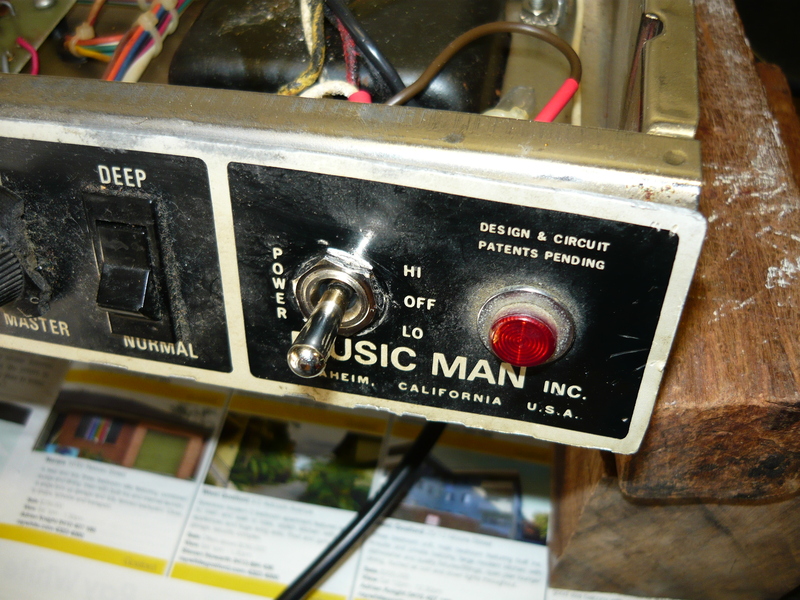 The highly reliable and great sounding MusicMan chassis was let down to some extent by pretty average speakers, especially in the bass guitar models. 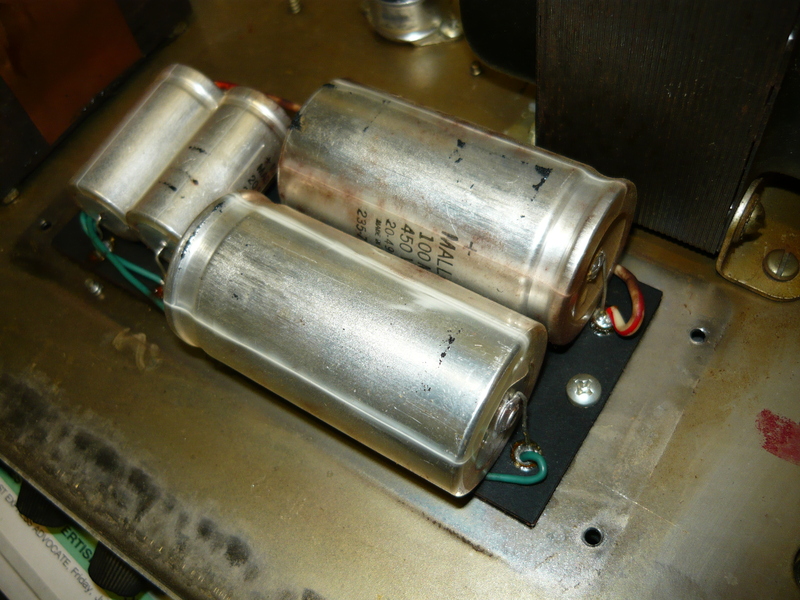 You will often see that the original speakers have been replaced, sometimes quite early in the working life of the amp, or in the case of the amp heads you will almost always see them hooked up with a different brand of speaker cab. Not surprisingly, the MusicMan amps strongest appeal was their great “clean” tone, reminiscent of the very best of the Fender tones. When it comes to overdriven sounds………..forget it ! You will need your pedals for that. What style of guitarists love their MusicMans ? Most probably those playing country rock, rockabilly, old-school rock and blues and any traditional roots music styles. The 130W model is clean enough for keyboards, too. 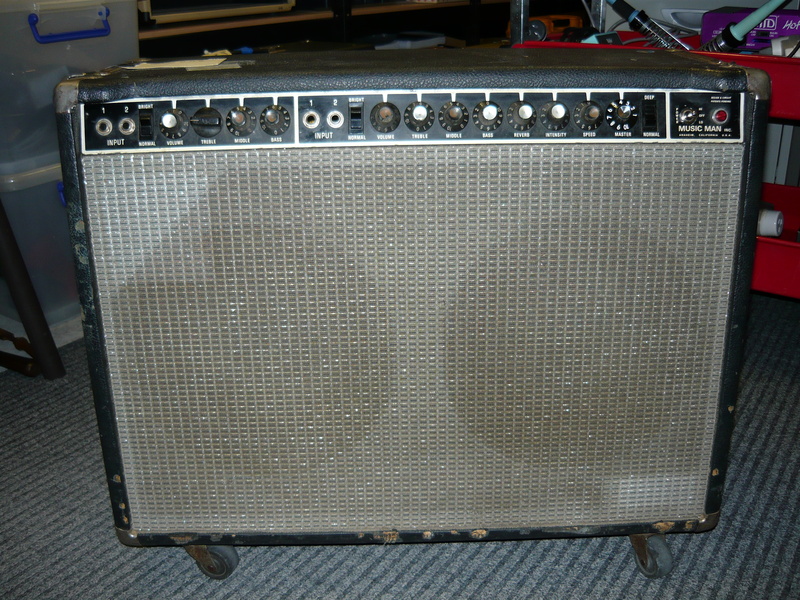 This particular example was damaged some years back at the Goulburn (NSW) Blues Festival. It was quickly patched up to get through the gig, but this amp as is would never pass an electrical safety inspection that meets Workcover NSW compliance. You can see from the thumbnails there are quite a number of outstanding service issues to be resolved. Firstly, there was some doubt as to whether the power transformer itself was 100% functional, as it had temporarily been rewired for half-power only. The wiring and general internal appearance of the transformer looked pretty crusty. I had to suss out the colour code for the primary connections in order to make any sense out of the situation. Having achieved that, the first step was to replace the damaged 3-core 240V flex and 3-pin plug, and to make a new chassis earth connection which would achieve compliance testing. This involved rewiring the fuseholder as well. Beware: the fuseholders in some older amps are not wired in a way that meets electrical safety standards, ie they are wired so that the outer part of the fuse remains active, even if the fuse is blown. If this is the case, the wiring should be reversed. The fuse should also be wired in series with the 240V active (brown), NOT the neutral (blue). Refer all such issues to an experienced and trusted technician ! The next step was installing a new power switch on the front panel. This is actually a 3-way SPDT toggle switch with a centre-off position, labelled HI/OFF/LO. What is actually happening is the incoming 240V AC can be switched to either one of two primary voltage taps, which gives higher or lower internal DC voltages to power the EL34 output valves (tubes). In all cases we insulate the high voltage connections with heatshrink. 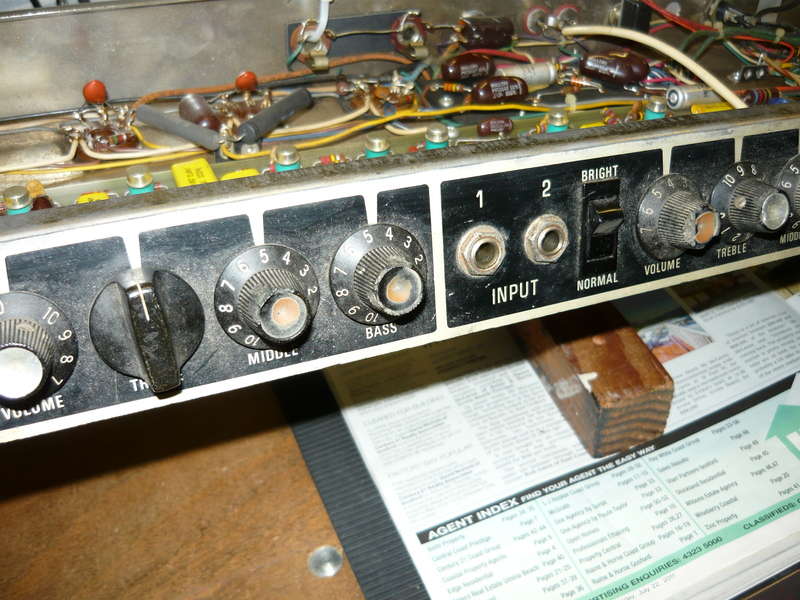 The unusual design feature of these amps, apart from a completely solid-state preamp, is the fact that on the HI power setting, the EL34 output valves have +700V DC on their anodes, and +350V DC on their screen grids. 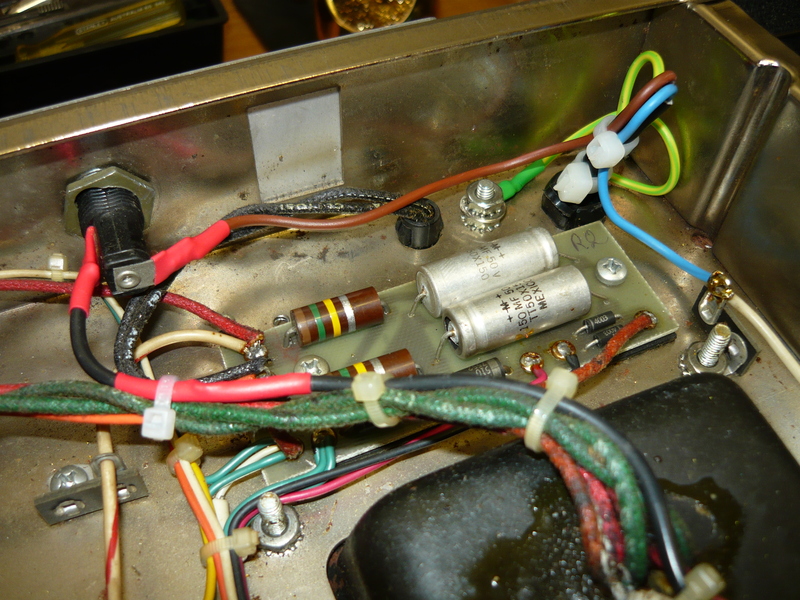 You cannot install cheapo valves in this amp and expect them to last very long ! Stick with brands that have a proven track record in reliability, for example JJ are a good choice for this amp. 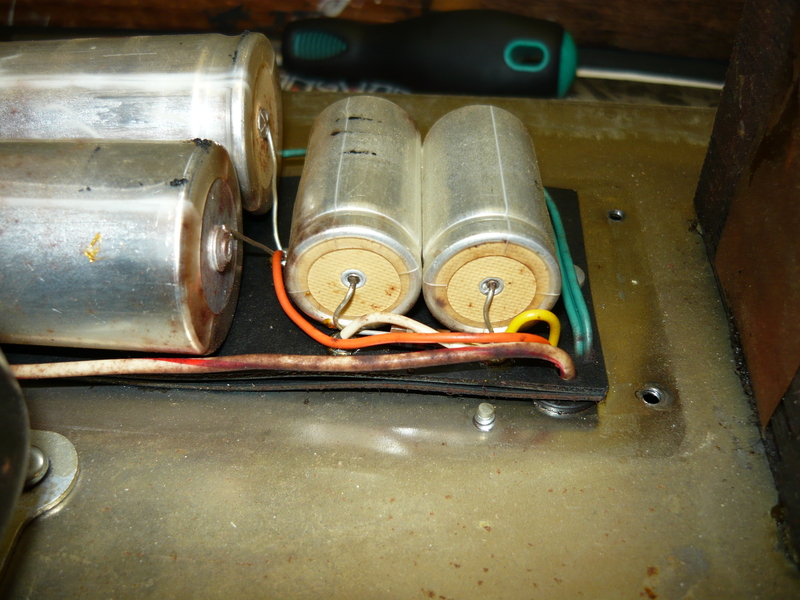 The next step was to replace a number of electrolytic capacitors in the high voltage (HV) and low voltage (LV) power supplies, all of which were still original and starting to look very crusty indeed. The HV supply requires a pair of 100uF/500V capacitors in a voltage-doubler configuration for the 700V supply, and a pair of 22uF/500V capacitors after the filter choke for the screen grid and phase-splitter supplies. For the bias voltage supply we needed some 100uF/100V capacitors. The HV supply caps are mounted in their own “can” on the top side of the chassis. All the capacitors were bedded down in some silicone to keep them secure and to take the strain off the leads. For DIY people out there, always make sure that you use “neutral cure” silicone, ie non-corrosive, or you might be in for a nasty surprise in the long-term. 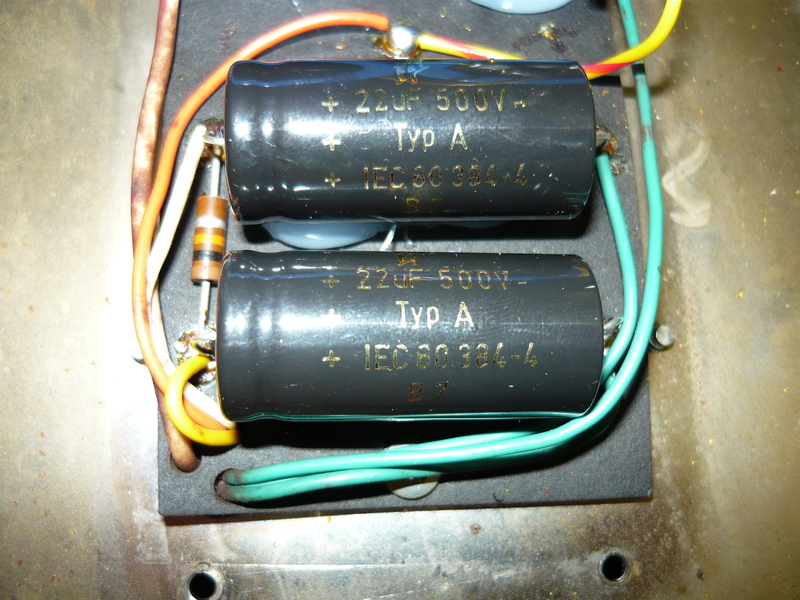 Equally as important as the HV supply capacitors, is the replacement of the LV supply caps, which in the case of the MusicMan amps, shares some common circuitry with the bias voltage supply for the EL34 output valves (tubes). Rock-solid biasing of the output valves will depend on the quality of the bias voltage supply. 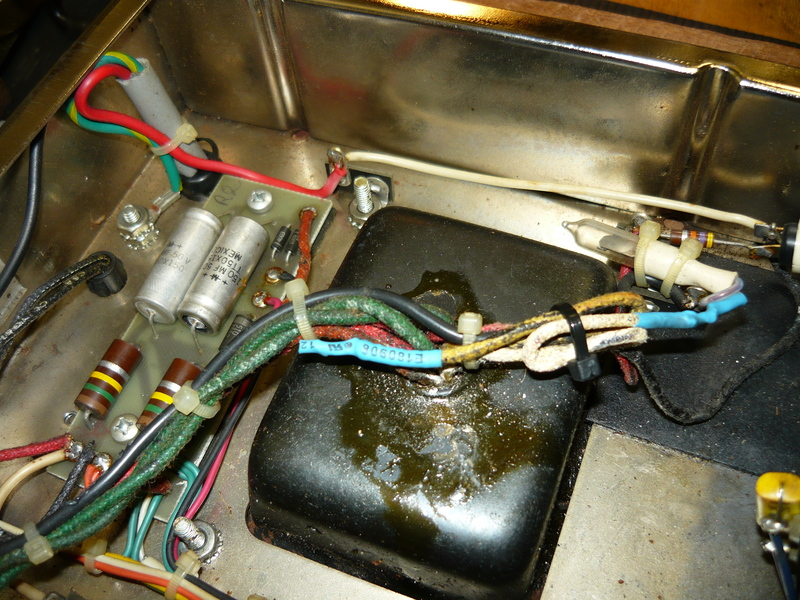 Well, to wrap it all up, I cleaned up the input and output jacks with DeOxit, and installed a JJ 12AX7-S in the phase splitter valve position, and installed a matched and burned-in quad of JJ EL34 valves in the power amp sockets. I set the bias for the EL34’s for 25ma cathode current each at 700V HT, as per the original spec. This is quite adequate at 700V. A power output test and burn-in test is then carried out – the amp is hooked up to an 8 ohm dummy load and a signal generator connected to the input jack. Observation of the sine wave output into 8 ohms reveals a clean signal and a power amp that reaches the onset of clipping at approx 120 watts rms. The power amp drops into “class-B” as we get closer to maximum power output, as expected. The final play test was fine – the reverb and tremolo both work OK, although the solid-state reverb is not comparable to the valve-driven reverb on a Fender Twin, of course. You may notice the customer had removed the MusicMan logo (which was a bit toy-town looking), and the top strap handle, which he didn’t trust to carry the weight. The original speakers were replaced long, long ago with a pair of Etone 12-inch speakers, manufactured in Sydney. As a proud Aussie, I would like to say that the Etones sound great, but the reality is these speakers do absolutely nothing for this amp. They sound rather flat and overly bright. In order to demonstrate this to my customer, I played a TELE through the amp as is, then hooked up my workshop speaker cab, which is loaded with a 100W 12-inch Jensen NEO, and the difference in tone, complexity, and sheer volume was quite obvious. Perhaps this will be the subject of a future amp/speaker upgrade ?? See you next week – Ivan. 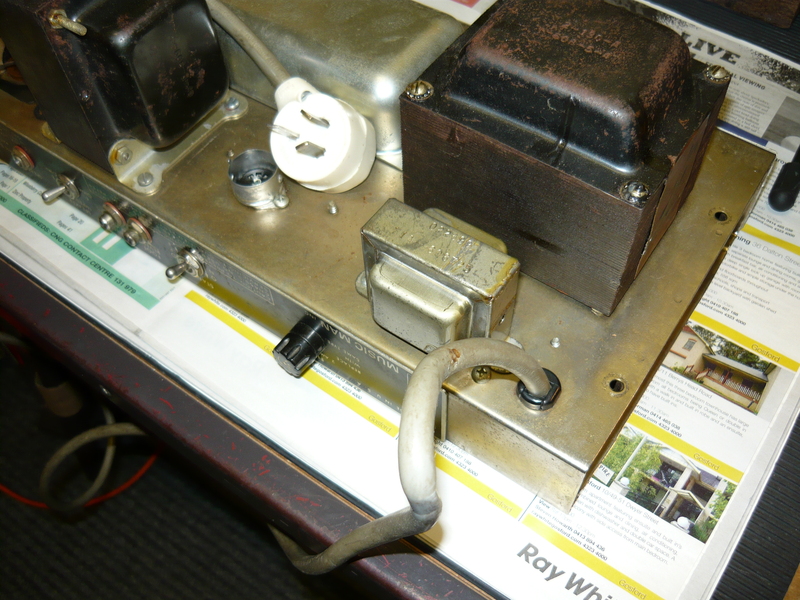 This entry was posted on September 25, 2011 at 3:29 am and is filed under Amp Repair, Amps. You can follow any responses to this entry through the RSS 2.0 feed. You can leave a response, or trackback from your own site.